Archives for October 2016 | Evelyn Mc Marketing! 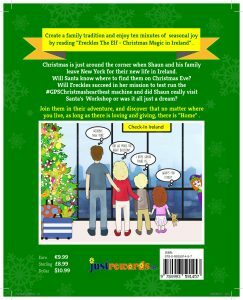 The story of “Freckles The Elf Christmas Magic In Ireland “is about a little boy called Shaun and his family who leave New York just before Christmas for a new life in Ireland. His parents having left during the recession are returning “HOME” to a new Ireland, a land of growth and possibility. Through this magical story, we discover how we are all part of a greater global family and how each kind act will help Santa find us all on Christmas Eve through his magic #GPSChristmasHeartbeat computer. I have just wrote my fourth book this year, so I suppose that makes me an author! (View them all here)Although to be honest I still find that hard to accept, the title of writer suits me better. 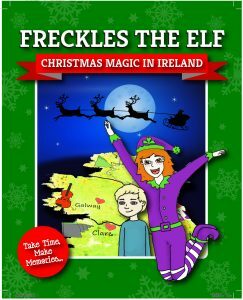 My most recent book is a children’s Christmas story called Freckles The Elf Christmas Magic In Ireland. A magical book sprinkled with opportunity to create memories and traditions with those close to you, while sharing the book during the festive season. Born from a family tradition in our own home of reading a book on Christmas Eve to the family, one that still continues even though the now grown up kids are in their twenties. they in turn will hopefully carry this tradition into their own families in their more mature years! 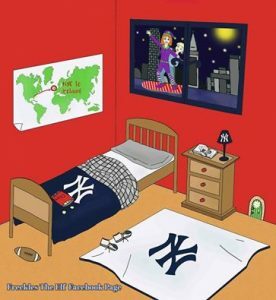 Meet Shaun and his family who leave New York just before Christmas for a new life in Ireland. 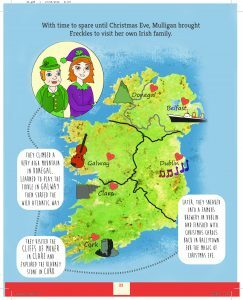 His parents having left during the recession are returning “HOME” to a new Ireland, a land of growth and possibility. Discover, through this magical story how we are all part of a greater global family and how each kind and loving act will help Santa find us all on Christmas Eve through his #GPSChristmasHeartbeat computer. The book is available now to buy now.